I recently learned about a new compendium of delightfully useless information that should be must-reading for any music aficionado. Tom Moon, a critic and frequent contributor to NPR’s All Songs Considered (a must-listen for anyone interested in new music), has published a new book (and launched a Web site), 1,000 Recordings to Hear Before You Die. Nearly four years in the making, this guide offers Moon’s far-reaching, eclectic, encyclopedic (it covers the entire history of recorded music), and no doubt debatable choices for the essential albums of all time. In addition to providing the necessary reviews, suggested optional titles, and trivia related to each entry, it is well written, informative, and highly entertaining. It’s certainly great bathroom reading, and it’s definitely atop my holiday wish list (hint, hint). The book also gave me an idea for this week’s post. In the bucket-list spirit of Moon’s book, and others of its “1,000 [Something] Before You Die” ilk, I’ve compiled a (much shorter) list of my own: 10 recordings (and 1,000 words or so about them) to hear right now, or, at least, before the end of the year. By no means is this intended to be definitive (there are still two months left in 2008, after all) or comprehensive — many acts have put out recordings this year that I liked, but I’ve already written about them (here, here, here, here, and here, for instance); while others, like Radiohead and Vampire Weekend, whose new CDs were officially released in 2008, made a bigger splash last year via the Internet; still others of note (Coldplay, R.E.M., Beck, etc.) received enough attention elsewhere. My goal here, as always, is to point out new releases from 2008 that you may have never heard of, or may have overlooked, but that I think you may enjoy. There are some stalwarts on the list who are still making great music, some established artists that you may be familiar with in one capacity or another, and then, I hope, a few surprises. 1. The Airborne Toxic Event — If you have been wondering when the ’80s were going to mount a comeback, stop: They’re back, and this band is one of many these days that is providing the soundtrack. TATE, though possessing qualities unique to the ’00s (as is inevitable), their sound nonetheless recalls a number of their predecessors who played continuously on what was once called “college radio.” Ringing through the well-crafted cuts on this self-titled debut, such as “Gasoline,” “Sometime Around Midnight,” and “Does This Mean You’re Moving On?,” I hear the vestiges of The Romantics, John Cougar Mellencamp, The Psychedelic Furs, U2, The Church, and others, and I like it. 2. The B-52′s – Another sign (calling from deep in outerspace) that the ’80s have returned was the release of Funplex, the band’s first album of original material in 16 years. This time around, the frenetic foursome from Athens, Ga., does not just comprise the B-52′s, they actually are 52, and older — Kate Pierson turned 60 this spring. Luckily, though, they haven’t lost their edge, and I would bet they haven’t had such a good time making music since 1989′s Cosmic Thing, which included the dance-party-rave fave, “Love Shack.” All the elements are intact: Fred’s signature sprechgesang and otherworldly lyrics, the soaring girl-band vocal harmonies, the rubber-band guitar lines, the shimmy-shimmying tempos, and lots and lots of F-U-N. Try the title track, along with “Hot Corner,” or “Pump,” and see if you can keep from turning up the volume. 3. Eef Barzelay – This spring, Barzelay, one of the greatest unknown singer-songwriters of the last decade or more, released Lose Big, his second solo effort, and signaled the official end to his former band, Clem Snide (RIP). As he has done in the past, Barzelay seasons these 10 melodic, downbeat, finely-wrought tunes with catchy hooks and memorable, witty turns of phrase equal to the likes of Paul Westerberg. But with an edgier, more expansive sound, as on the title track and “Could Be Worse,” and a richer approach to song production (his first solo, Bitter Honey, was essentially guitar and vocals), Barzelay may soon win big, too. 4. Hayes Carll – On Trouble in Mind, his third, Carll shows that he’s still an old-school honky-tonker, with a knack for Nashville style and flair. There’s plenty of swirling pedal-steel guitar, swinging boom-bop-ba-boom bass, and swishy drums on this record to make even the upper-crustiest listeners bob their heads and tap their toes (for instance, give a listen to “It’s a Shame“). But Carll also has a sharp funny bone, and that’s what makes this record stand out. More Steve Earle than Earl Scruggs, his sense of humor twangs his heavy Texas drawl with just the right touch. For instance, I suspect that though the lyrics to the irreverent “She Left Me for Jesus” won’t get him in the door to heaven (or the Grand Ole Opry), they sent him blaspheming all the way to the bank. 5. Elvis Costello — The Woody Allen of independent-minded music-making, Costello is one of the most talented, prolific and inventive (if sometimes uneven) musicians of his generation. He’s also one of the hardest-working, at least over this past year, contributing songs to new releases by Jenny Lewis and Lucinda Williams, as well as releasing Momofuku, his 35th studio recording. Perhaps because he’s been so busy, Costello likely couldn’t dawdle in the studio. As a result, the record, featuring his longstanding back-up band, The Imposters, is a stripped-down, punched-up, straight-ahead rocker. Which, at least to me, is the best way Costello showcases his talents. Try “No Hiding Place,” “Turpentine,” and “Go Away” (with Jenny Lewis, returning the favor). 6. Cut Copy – Here’s another exclamation-pointed example of why it’s cool to feel 1980s deja-vu nostalgia all over again. With In Ghost Colours, their second record, these kids from Melbourne, Australia, prove they are able riders of the new New Wave rolling into rock radio stations right now. 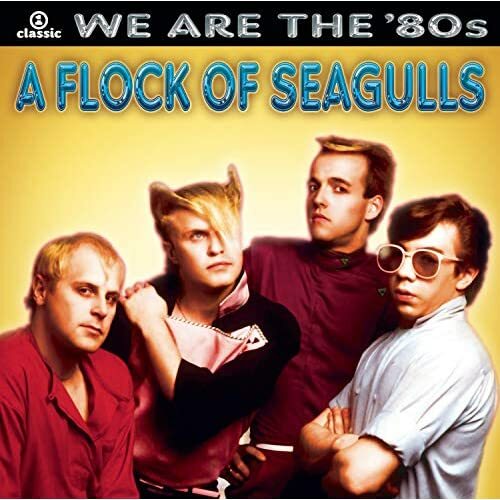 This collection of light, catchy, guitar-accented, electronic dance-pop songs, such as “Lights & Music,” “Unforgettable Season,” and “Hearts on Fire,” will make you think of The Fixx or Flock of Seagulls — but (and this is the best part) this trio wears T-shirts and oxfords, doesn’t go to a hairdresser, and their music makes them smile. 7. The Decemberists — Although only doling out three EPs’ worth of music this year (Always the Bridesmaid: A Singles Series), with the promise of a full-length sometime next year, The Decemberists have nonetheless delivered a cache of great songs that fit right in with the rest of their canon. Standouts “Valerie Plame,” an upbeat ode to the eponymous spy from Vol. 1, follows the same lyrical lineage as ”The Bagman’s Gambit” from Picaresque, while the rollicking ”Days of Elaine” from Vol. 2 could easily have been found on The Crane Wife. Also worth mentioning is frontman Colin Meloy’s solo CD, Colin Meloy Sings Live!, released early in the year. The collection of songs, recorded during a brief tour in 2006, features his own material and some covers celebrating his (not surprising) roots in English folk music. My favorite is “Wonder,” a rare occasion when the bespectacled songwriter takes a break from staring out of the castle tower window of his imagination and looks in the mirror to consider the impact of the then-pending birth of his son; it’s affecting without affectation. 8. The Helio Sequence — One of my favorite recordings of the year is Keep Your Eyes Ahead, the latest from this Oregon-based duo. They have perfected an indie-pop sensibility that combines a variety of genres and styles, from sparse acoustic folk to prog-rock to post-punk to shoegazer to dance and electronica, forming a lush, complex sound that feels timeless, rooted in both the past and present. A bunch of hooey, right? OK, think Dylan meets Supertramp meets The Cure meets John Lennon meets The Jesus and Mary Chain meets The Smiths meets Modest Mouse meets Tears for Fears meets Talking Heads, etc., and you’ll get a better sense of what I mean. Probably the only way to really understand what they’re doing is to plunk down a couple of bucks for some songs, like “Lately,” “Can’t Say No,” and the title track, for starters. I may have confused and disoriented you, but you’ll thank me for it. 9. Jenny Lewis — No one I’ve heard in the past few years has a more natural singing voice than Jenny Lewis. Hers is not a perfect instrument, but it’s pure, authoritative and full of raw emotion, like Linda Ronstadt at her peak or Maria McKee. It’s the kind of singing that stops me cold, grabs me by the collar, and makes me listen up. I felt this way when I heard her first release, Rabbit Fur Coat, which was a delight, featuring contributions from The Watson Twins, Conor Oberst, M. Ward, and others, but was somewhat uneven. This time around, on Acid Tongue, Lewis (also the lead singer for Rilo Kiley) again teams up with some other notable singers (including Chris Robinson of the Black Crowes, on the title track, and the aforementioned Elvis Costello, on “Carpetbaggers”), but it’s her singing and solid songwriting that help keep her on a more even keel. 10. Ana Laan – This multi-talented and multi-lingual (she sings in English, Spanish, French, and Swedish, sometimes all together, as on “Ex”) Madrid-born songwriter rolled out a breezy, sultry sophomore recording of Latin-influenced late-night music. On Chocolate and Roses, Laan offers an infectious, heady mix of styles, effortlessly slipping into and out of acoustic jazz and samba, pop, and electronic moods. She’s also a bit of a mockingbird: on some songs, such as the title track and “Paradise,” she chirrups like a cool Calypso version of Dido or Lily Allen. At other moments, I hear strains of various female birds of a feather, such as Regina Spektor, Bjork, Sade, and Annie Lennox. So, there you have it: My picks for the 10 essential recordings of 2008, at least in relation to the other essential recordings from 2008 I’ve covered in previous posts, as well as the ones that haven’t been released yet or I’ve yet to hear. (See what I mean about being definitive.) Let me know if you disagree with any of my choices, and feel free to make suggestions of your own. Saw a review for Clem Snide. Wanted to let you know that the band is back together and has a new album – Hungry Bird – coming out on February 24th.